The evening started off with me giving an American craft brewery that I have had in the past but not really enjoyed another chance. It ended with American craft beer number 273 becoming Bigfoot by Sierra Nevada Brewing Company. In between is the story. Before I go any further I am not going to mention that brewery that wasn’t named above, although their name is comprised of two animals and they consider themselves dark beer specialists. The beer I opened, which I had actually been looking forward to, was an contaminated. The pour was one part beer, 150 parts foam. There was a sour smell and that’s as far as I went. I have had this from them before. I was in the mood for a high quality American craft beer. No exceptions. That’s where Bigfoot stepped in. An American Barleywine, Bigfoot packs a wallop of west coast hops in the shape of citrus to cut through the big malts. Smooth for the age (’10) while having enough sweet, dark fruit malts to hold up. Great beer for that occasional barleywine itch that I get. Enjoy! Useless Fact: In 1905 the Bosco company of Akron, Ohio, marketed a “collapsible Rubber Automobile Driver.” The figure, deflated and kept under the seat when not in use, was a kind of dummy intended to scare thieves away when the car was parked. American craft beer number 272 comes all the way from Arizona in the shape of Old Monkeyshine brewed up by Nimbus Brewing Company. After the onslaught of IPAs that I have had recently, I am trying to clean my senses so that they can recoup their freshness in appreciating said IPAs. Old Monkeyshine has been in the cellar for about a year, aging. The beer pours a deep brown with an inch of foam that leaves little to no lacing behind. Aroma and taste are similar: dark fruits are strong and mildly, at times, dominate the beer. Kept my interest enough to want to try some of their other brews. Enjoy! Useless Fact: The Washington Monument sinks 6 inches every year. Without transactions I wouldn’t be able to try some of the wonderful American craft beers throughout the United States. Wit that in mind the beers for the next 7 – 10 days will be from that method. Alpha Centauri Binary IPA by Hop Valley Brewing Company steps in as the first American craft beer to start off the celebration. 😉 An Amerian Imperial IPA, Alpha Centauri has a bunch of west coast hops that burst through in the aroma and taste. Citrus is the main course but tropical and grass aromas are prevalent too. Bread malt aromas give a slight homage to English IPAs before the hops once again squash any type of connection. Originally brewed to commemorate Hop Valley’s 100th batch, Alpha Centauri is now a seasonal that I could see locals clamoring over each release. Enjoy! Useless Fact: If one started counting the moment he or she was born and continued counting without stopping until he or she reached the age of sixty-five, that person still would not have counted to a billion. American craft beer that is brewed by Oakshire Brewery has been on Rich’s and my radar for a while. We have heard good things about their craft and have always wanted to lay our hands on a few bottles. Of course beer trading makes this all possible when there really is no other viable method of landing Oakshire beer. 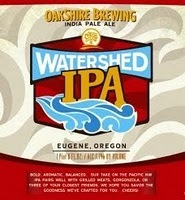 A recent transaction landed us a bottle of Watershed IPA, Oakshire’s year round American. The beer is straight forward centered around hops. Floral, citrus, grapefruit, and I even thought wood hop aromas poured from the glass. Pale malts are the backbone with the beer showing little signs of sweet while being dry. Possibly too much for your casual American craft beer drinker, Watershed is a rock solid beer that would easily be appreciated by any hop head. Enjoy! Useless Fact: Suetonius Tranquillis reported in his Life of Augustus that the great Roman poet Vergil once held a funeral for a dead fly, complete with pallbearers and lengthy eulogies. In ancient Rome, cemetery land was not taxible. By interring a fly on the land surrounding his private villa, the wily poet turned his home into a burial ground and thus made it tax-exempt. Trying new American craft beer from American craft brewers is part of the excitement of the hobby. Having so many different offerings to choose from is what allows people to make the transition up the ladder from small to medium to, eventually, big beers. Along the way there are bumps in the road. Few and far between but they do occur. Beer number 266, Wee-Heavy-er by French Broad Brewing Company, is a casualty for me. I try to find good in every beer but Wee-Heavy-er and not knock a brewer for their hard work and effort. I couldn’t find it in this beer nor could I finish. I was really in the mood for a beer last night so I followed up with Illumination Double IPA by Central Waters Brewing Company. I have already had this as part of my 365 American craft beer but it one that I like. So the evening ended well. Enjoy! Useless Fact: Fagin, the sinister villain in Charles Dickens’ Oliver Twist, was also the name of Dickens’ best friend, Bob Fagin. Everyone has little quirks. Mine is never setting anything to an even number, especially for my alarm clock. Numbers that end in 1, 2, 3, or 4 or the common time settings. I have done this with the 365 American craft beers in 365 days endeavor too. I wrote a while back (can’t remember the damn entry myself) that I wasn’t going to celebrate day 100, 200, etc. Today though is close to a celebration: only 100 more beers to go, yeah. I can see the light at the end of the tunnel. Actually still 101 days (see has to end in a non-normal number) since I doubled up on a beer; I have to go to beer 366. Mayflower Porter by Mayflower Brewing Company bellies up as beer number 265. Porter is actually an English Porter that fits the style well. The beer I had was a good sixteen months old. It aged well. Aroma and taste were perfect in my book. Roasted, chocolate, caramel, and coffee all come through with the roast probably being the biggest on the senses. The beer finishes dry, real dry, while there is a good bitterness from the malts to balance in the finish. Roast and coffee linger a bit. A solid beer that deserves a try. I need to get my hands on a fresh bottle. Enjoy! Useless Fact: A person uses more household energy shaving with a hand razor at a sink (because of the water power, the water pump, and so on) than he would by using an electric razor. You are currently browsing the Sips blog archives for August, 2011.